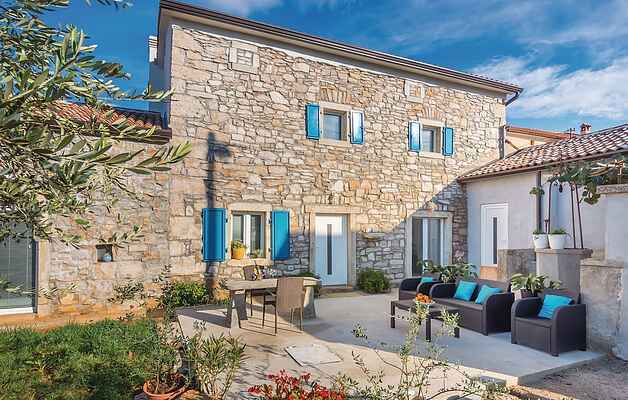 This beautiful and comfortable, traditional stone holiday home is located in a small Istrian village only approximately twenty minutes drive away from the famous tourist resort of Rabac. The house has been completely renovated and adapted to modern lifestyles, although traditional architecture of Istria has been preserved as well. Guests have at their disposal a spacious swimming pool and a large natural plot. Explore the natural beauty and scenic surroundings by the bicycle. In very short time you reach all the interesting sights in Istria, while the closest is the historic town of Labin with the Venetian church, museum and cute small galleries.